Ah, the leaves are turning color and Pumpkin Spice Lattes are back in full swing. The air is getting crisper, Costco has Christmas decorations up before Halloween, and before you know it, it will be time to set our clocks back an hour. While most of the world is looking forward to gaining an extra hour of sleep, parents are realizing the possibility of their baby waking at ungodly hours of the day- as in before the PSLs are being served at the local coffee shop. Pour yourself some coffee. Any coffee. We call this the intentional plan because most parents “intend” to do this, and then they don’t. But, let’s say you do plan ahead. Start moving bedtime later by about 15 minutes each night a few days ahead of time ( I recommend 4-5 days before we turn back the clock). Adjust nap times the same amount each day (pushing later about 15 minutes). Younger babies (under 6-8 months) often respond well to this plan, as they tend not to do well with large shifts (as described below). Most families start with the thought that they’ll do the “intentional Plan’ and actually ending up with no plan at all, resulting in adjusting the same day. For older babies, this is easier since they can handle larger shifts. Day of time change your baby or toddler will wake early (6:00 which feels like 7:00 to them). Do your best to stretch them to the regular times based on the clock- not their “old” time. This will take about 3 days for them to resettle, just like us adults. If they can’t quite reach their regular times, that’s ok! They will settle out in the next few days. Example: Bedtime is 7:15, which feels like 8:15 to them. If they aren’t able to make it this long, put them down a bit earlier (like 6:45 or 7:00 according to the new time). 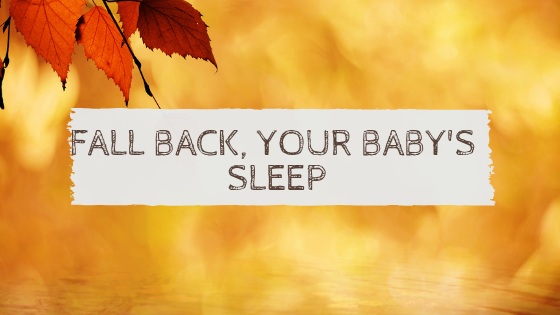 By the end of the three days their circadian rhythm will have adapted, and you’ll be back to your Pumpkin Spice Lattes.